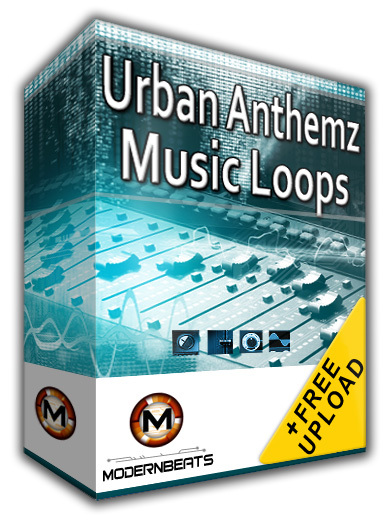 Urban Anthemz Music Loops - Urban Hip-Hop Melodies, Riffs, & Hooks - All Instrument Loops, No Drums! Download Urban Anthemz 1 - After months of extensive energy & creativity was poured into this innovative music loop library, ModernBeats delivers simply the hottest urban melodies, riffs, and hooks you'll find in Hip Hop: "Urban Anthemz Music Loops 1 ". Featuring over 200 captivating, hit-making melodic loops in WAV/AIFF/REX2 formats (600 files total), this groundbreaking hip-hop loopset contains 50 melodic themes at tempos 92BPM-102BPM. For a full list of instruments included in volume one, check out the list below. The "Urban Anthemz" loop series works seamlessly in combination with ModernBeats' existing "Platinum Rhythmz" loop series with both series utilizing same group & tempo layouts. This allows users to build full productions within minutes by mix-matching & layering loops from each series together. Urban Anthemz Loops Instruments - Ethnic woodwinds, orchestral woodwinds, full brass sections & stabs, trumpets, saxophones, ethnic strings, sitars, dizus, erhus, guchins, yangchins, pipas, tremolo strings, violins, cellos, pizzicato & exotic plucking, electric guitar, acoustic guitar, flamenco guitar, wah-wah guitar, banjo, harps & harp glissandos, classic pianos, baby toy pianos, xylophones, marimbas, metallic bells & tines, synth pads, choir pads, analog synths, sound effects, ambiences, atmospheres, plus more! With the 4 variations for each 50 loop themes included (source hook melodies, hook variations, source verse melodies, & verse variations), you can effortlessly create professional productions with longer evolving phrases while avoiding monotonous, overly repetitive compositions! Equipped with the ModernBeats standard, you can build blazin' groundbreaking melodic hits fast with access to 4 variations per melodic theme! Download the whole Urban Anthemz library (Volumes 1 & 2) to inspire, enhance, & bring your music production to the next level. Raise the standard, demand the best - Urban Anthemz will launch your beats into a world above the rest!